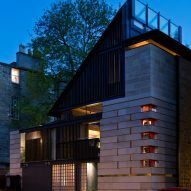 Secret hatches, moving walls and a sliding ladder all feature inside the Edinburgh home of architect Richard Murphy, which has been named RIBA House of the Year 2016. 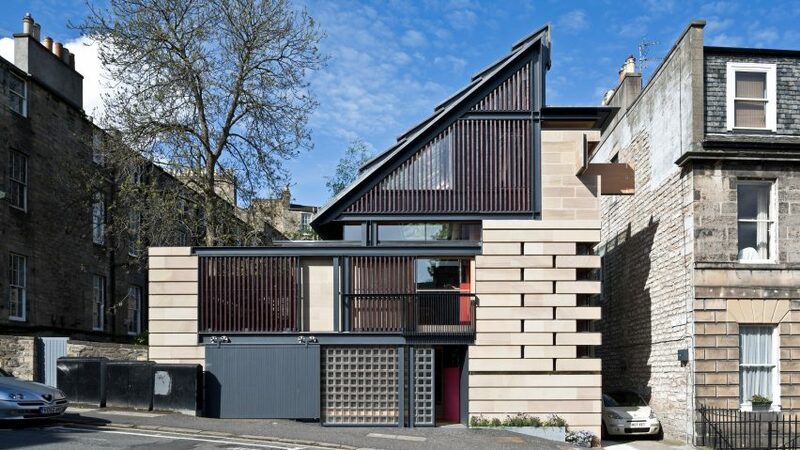 Called Murphy House, the five-storey "box of tricks" house in Edinburgh saw off competition from 19 other projects to win the RIBA prize, which recognises the best new houses in the UK each year. The announcement was made during the final episode of a TV series, which aired on Channel 4 this evening. Murphy House is the culmination of nearly a decade's work by the Richard Murphy Architects founder. Based on the work of the architect's heroes, including Carlo Scarpa and John Soane, it features an assortment of adaptable spaces and nifty features. 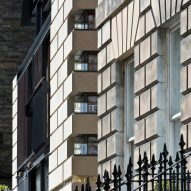 The property forms a new end to a conservative terrace in the Scottish capital. It boasts sandstone walls, matching its neighbours, but also features louvre-fronted windows and a 45-degree roof covered in solar panels. Inside, occupants can vary the degree of light and privacy by folding panels in the walls. Other features include a bedroom with a concealed bath, a kitchen raised up so visitors can't see the mess, and a subterranean library, which is where the sliding ladder can be found. There is also a courtyard and roof terrace. The award was judged by Mole Architects founder Meredith Bowles, Charlotte Skene Catling of Skene Catling de la Pena, Jonathan Dallas from Dallas Pierce Quintero, Wallpaper's Elle Stathaki and Phil Thorn of insurance company Hiscox. "Murphy House was a real box of tricks with a unique, playful character," said Philip Thorn. "Although a small property, it was deceivingly large inside due to the clever use of space. 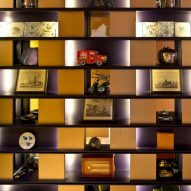 Every room contained a surprise and the attention to detail was exceptional," he continued. "The roof terrace was a real oasis of calm and I loved the long list of environmentally friendly touches. A true pleasure to visit and I would imagine a lot of fun to live in." Murphy House was one of 20 projects that made the longlist for the prize. These were whittled down to a shortlist of seven over the four-week run of the House of the Year TV series – a spinoff of popular show Grand Designs. The other six shortlisted projects were a forest home for a pair of artists, renovated mid-century house, home and studio with a rooftop garden pyramid, a Japanese-inspired townhouse, a sunken mirror-clad residence and a home made up of red metal huts. 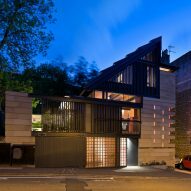 According to RIBA President Jane Duncan, Murphy House was this year's best example of "how to overcome challenging constraints – from planning restrictions and an awkward site in an urban location – to build a stunning house". "This house is a true labour of love for Richard," she said. "Part jigsaw puzzle, with its hidden and unexpected spaces, and part Wallace and Gromit with its moving pieces and disappearing walls, this is a model house of pure perfection and a worthy winner of the RIBA House of the Year 2016." The prize was founded in 2001 and was formerly known as the Manser Medal, but was rebranded last year to suit the new televised format. Last year's winner was Flint House by Skene Catling de la Pena – a house clad in pieces of flint, designed for one of the world's richest families. Other past winners include a revamped a stone barn in Wales and a London house with translucent glass walls. Photography is by Keith Hunter.